We’re talking the rather-large black hole at the heart of Messier 87 in the galaxy Virgo A, which has now been captured by the Event Horizon Telescope (EHT) collaboration – a planet-scale array of eight ground-based radio telescopes. It’s been linking radio dishes across the globe to create an “Earth-sized interferometer” in order to measure the size of the emission regions of two supermassive black holes (SgrA* at the centre of the Milky Way and M87 in the galaxy Virgo A). In a nutshell, the image shows the ring formed as light bends in the gravity around the black hole. Altogether, it’s an amazing scientific experiment – showing what can be achieve when the finest minds work together with expensive technology. Officially, the EHT is described as a very long baseline interferometry (VLBI) array, which comprises millimeter- and submillimeter-wavelength telescopes separated by distances comparable to the diameter of the Earth. Reportedly, the level of detail involved, captured at such a distance, is equivalent to seeing the seeing details of an orange on the moon while positioned on the Earth. 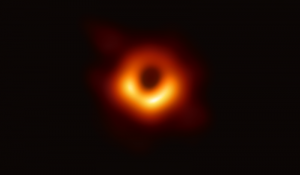 What is shown in the now-famous image is the calibration and reduction of the 1.3 mm radio wavelength observations of the supermassive black hole that were taken during the 2017 April 5–11 observing campaign. And the numbers involved are amazing – the black hole’s boundary measures 40 billion km across, which 6.5 billion times bigger than the Sun, says EHT. Addition of key millimeter and submillimeter wavelength facilities at high altitude sites has now opened the possibility of imaging such features and sensing the dynamic evolution of black hole accretion. 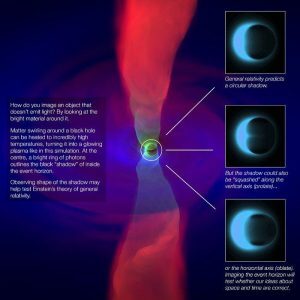 The EHT project includes theoretical and simulation studies that are framing questions rooted at the black hole boundary that may soon be answered through observations. To build the virtual telescope, eight observatories at six geographical locations were involved: the ALMA and the Atacama Pathfinder Experiment (APEX, in the Atacama Desert in Chile), the Large Millimeter Telescope Alfonso Serrano (LMT, on the Volcán Sierra Negra in Mexico), the South Pole Telescope (SPT, at the geographic south pole), the IRAM 30m telescope (PV, on Pico Veleta in Spain), the Submillimeter Telescope (SMT, on Mount Graham in Arizona), and the Submillimeter Array (SMA) and the James Clerk Maxwell Telescope (JCMT, on Maunakea in Hawaii).